Narrow stair treads can be inconvenient and even dangerous. What many people don't know is increasing the width of stair treads doesn't necessarily require a complete rebuild of the entire stair case. Instead, you can add a simple extension to the front edge of each step. In order to accomplish this, first you must cut the front edge of the tread flush with the existing riser to allow for the extension. 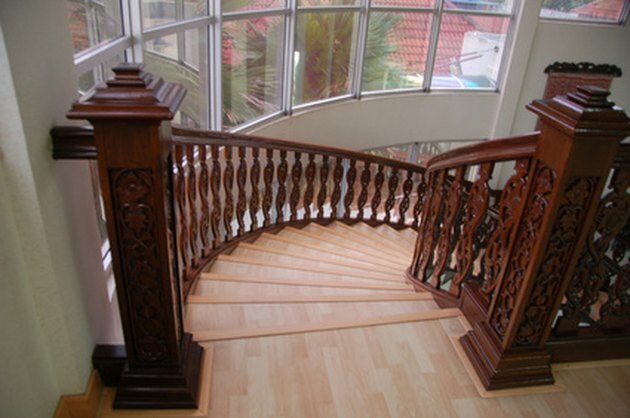 Wooden stair treads are simple to extend. Install a flush cut bit with a bearing into your router. Turn the two collet nuts with wrenches. Turn the outside nut counter clockwise and the inside nut clockwise to open the collet--and the reverse to close or tighten it. Adjust the depth of the router bit so that the bearing will ride on the face of the existing stair riser—the vertical piece on the front of each step--and cut the edge of the tread flush. Run the router left to right along the edge of each stair tread to cut the lip from its edge, leaving it flush with the face of the riser. Using a table saw, cut a new riser face for each step from ¾-inch-thick hardwood. Cut the pieces the same width as the original riser faces and as tall as the riser from the top of the tread below to ¾ inch from the top of the tread above. Cut hardwood extensions for your steps from ¾-inch-thick hardwood, as wide as the edge you cut from the step, plus ¾ inches for the stair riser face, plus ¾ inch. For example, if you cut ¾ from the stair edge, your new extension will be 2¼ inches wide. Glue and nail these extensions to the top edge of each riser face plate you cut with wood glue and pin nail gun, so that one long, ¾-inch-thick edge is flush with the back face of the riser face. Drill pilot holes through the extension pieces every 8 inches. Drill them through the front ¾-inch edge out the back ¾-inch edge. Glue and nail the riser faces to the fronts of the existing risers with wood glue and a pin nail gun. Drive one treated deck screw through each hole in each extension into the lip of the existing tread. Use screws 1 inch longer than the width of the extension strips. Cut ¼-inch round over hardwood molding, ¾ inch wide to fit the front lip of each step and nail it to the lip of the step with pin nails to cover the screw heads. This process will extend your stair treads 1 inch.